« A Process of Elimination? Yesterday we spent a few hours with the Hase Pino. This was our main opportunity to test it and decide whether we will buy one. The plan was to ride it from JD Cycles’ shop in Ilkley along the back roads to Bolton Abbey and back (google map) a ride of about 13 miles. By the end of the day we were convinced that it was the right bike for us. Because Ruth and John, the proprietors of JD Cycles, had just taken the bike on a very arduous ride round the Yorkshire Dales Cycleway they had made a few changes, the main one being the addition of auxiliary Vee brakes on both wheels, controlled by the stoker, because they were concerned about some of the very big steep downhills on their route. However they had found the standard disk brakes on the Pino did the job without any help and as they are bigger people than we are I don’t anticipate we’ll need anything like that. I had a quick solo ride round the local streets to refamiliarise myself with the Pino but it all felt quite normal. Meanwhile John had found some slightly shorter front cranks so he fitted those before we started. Previously Isobel had found the standard cranks too long for her relatively short legs and her need to limit the amount of movement (extension) in her hip replacement, which is exaggerated in a recumbent position. 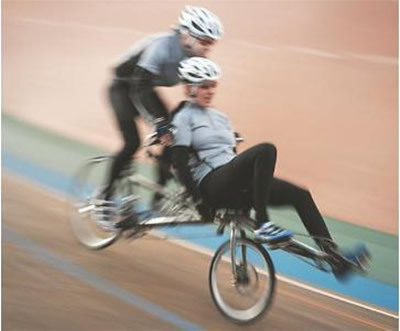 Ruth felt that the Pino created a mismatch between recumbent stoker and upright rider, she believes that the recumbent rider tends towards a slower cadence than the upright (she normally has quite a fast cadence). The general feeling was that an even shorter crank was needed to deal with both of those problems and John has a plan to drill the original cranks to provide some alternative lengths for test riding. The next question was about cleats. The Pino pedals are reversible with SPD fittings on one face. Neither of us have used cleats, preferring strapless toeclips that give some security but allow everyday shoes, but on our previous ride Isobel found it quite hard to keep her feet on the pedals. This seems to be quite a subtle thing, the Rans Screamer with slightly lower stoker cranks had not been a problem. It seemed a big investment to buy cleated shoes for a test ride but on the other hand we could not see any other way to solve the problem in the short term (I have a few ideas for what we might do when we have the bike and can experiment). Decathlon had some relatively affordable Shimano mountain bike shoes at £40 (still a lot of money for something you may never use again) and they seemed to fit. However, when we got home Isobel decided that, although they felt as though they would work fine on the bike, they were slightly large which made them a poor proposition for walking. Neither of us would accept the idea of cycling shoes that you cannot walk comfortably in – those cripple-feet shoes that serious road cyclists wear seem to destroy the point of cycling as pleasurable and practical transport. We took them with us as a last resort but JD cycles had a much better selection of shoes than any of the Sheffield shops, with half sizes. In the end Iso bought a pair of Pearl Izumi shoes that looked just like the kind of trainers she would be happy to wear anywhere, fitted well and were very natural to walk in with the cleats. A lot more expensive but we realised we were probably going to buy the bike so it seemed best to have the shoes she would be happy with. We’ll return the Decathlon shoes and probably swap them for a pair for me. It took a few minutes to set up the cleats and for Isobel to get used to the initial stiffness of the locking mechanism. A squirt of lubricant and a few trials and she began to find the action she needed. She was worried that the twisting release action was not a good one for her hip but when she found that she could release by rotating her heels inwards that seemed a lot better. (Inwards might be a problem in an emergency if you were the pilot but not an issue for the stoker who keeps their feet off the ground). Once we had been riding for a few minutes she became very comfortable with the cleats and had no problems locking and releasing, John commented that new cleats need around 20 or so actuations to start to loosen up. Later on in the ride she noticed that her left leg, with the new hip, was not following the straight line of her right leg, something she had seen before in an exercise bike. John explained that she could adjust the position of the cleat to compensate, something to discuss with her physiotherapist. We clipped on a couple of our panniers with drinks and some spare clothing layers and it was time to go. I was slightly nervous and never managed to feel totally confident about starting off but in fact we made smooth starts every time, including a tricky hill start later on. We cruised through the light traffic in Ilkley, negotiating several junctions and a busy set of traffic lights and it all felt fine. We then had a long downhill where we could pick up speed and freewheel, at the bottom when we tried to pedal away we found the chain had jumped off the outer chainwheel while changing up, which was disconcerting until we could work out what had happened. So on with the ride. It’s an ideal road for a weekend spin, as evidenced by the number of cyclists we saw. It runs parallel to the main road along Wharfedale but on the opposite bank of the river which came close from time to time, rather narrow and twisty which meant a few blind bends but also few cars and none going fast. The road has some hills but nothing extreme and we found no problems, although we did drop down to a very low gear a couple of times. We experimented a bit with Isobel stopping pedalling and it was difficult to guage how much effort she was able to add. Her experience was that there was not a lot of resistance in the pedals which reinforced the idea that she needed shorter cranks to match her effort more closely to mine. Once or twice she asked for a higher gear and then I found the new gear was asking for too much effort from me. We stopped along the way to adjust the seat as the back was rather slack and the buckles on the tensioning straps were pressing into Iso’s back. It took quite a lot of fiddling to get the seat properly tensioned and it never looks tidy, this seems to be something that Hase have yet to get right, although it looks as though just cutting the fabric parts a little more carefully might take out some of the wrinkles. On the other hand it’s well-designed to dismantle the whole seat and problems reported on earlier versions where the front rail of the seat (now removed) causes pressure on the thighs seem to have gone. The other stop was when we saw a large tractor coming downhill towards us, filling the width of the road, and we pulled into a convenient gateway to let it past. This was a bit of a problem as we had been approaching the hill at a good speed and I didn’t get down into a low enough gear for the hill start. It took a little while to get the bike into the right gear and the uphill start was a little nerve inducing. So far I’ve found that starting is OK unless there is traffic to watch for which means you can’t take your time. Starting is the main challenge. As well as being in the right gear, you have to go through a whole series of moves. I get the bike upright while standing stably on both legs astride the crossbar. Isobel gets seated and locks shoes into the SPD pedals. Once she is comfortable I have to move my weight on to one foot (usually my left) while keeping the bike and Isobel upright, this means my other leg, my right, is off to the right of my body on the pedal ready to push down but not, at that point, in a natural line. On a solo bike you would just lean the bike towards you but that would be very disconcerting for Isobel, and I would have to support her weight rather than just balance it. Then I say “backpedal” and Isobel has to allow me to bring the pedal back to the best position to push off. This is made difficult by the stoker’s freewheel, without it Isobel could just position the pedal ready for me, instead she can’t backpedal my cranks but she can resist my backpedalling. The whole thing was made more difficult at present because I was not using cleats or toeclips, but I really didn’t want to be dealing with those while learning the game. Finally I have to check behind for traffic and, if clear, warn her we are ready to go and then count “one, two three, go”. We both pedal on “go” and I have to swing myself up on to the saddle, while trying to move smoothly into the second pedal stroke so I don’t disrupt Isobel’s pedalling. Finally, if my left foot has landed on the wrong side of the pedal, once we are rolling well I call, “freewheel” so she stops pedalling long enough for me to flip the pedal over. For experienced riders all this is second nature but for us learners who have yet to tune in our shared reflexes everything has to be thought about. That also goes for hand signals, especially on the very sensitive steering of the Pino where I don’t yet feel comfortable about signalling. Gradually we are working out the different signals we need and the different calls I need to make to ask Isobel for them. It’s all made more difficult by the lack of mirrors on the demo bike, we are both used to mirrors, neither of us can see easily what’s behind, Isobel can’t hear cars that I can hear, so I have to get into the habit of telling her what’s happening behind before we need to react to it. Warning pedestrians is also tricky on little lanes and the Pino bell is useless, you have to take a hand off to use it. We’ll need to get some easy access bells and probably my Air Zounds horn for Iso to give a toot if we are approaching a gaggle of pedestrians from behind. The Pino with two up is just too big and unwieldy to respond quickly if somebody decides to walk into your path at the last minute. 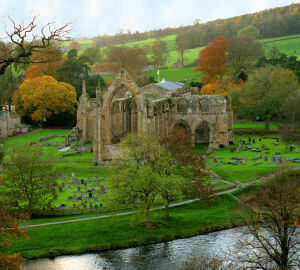 As we approached Bolton Abbey we joined a main road for a short distance, negotiating a roundabout with aplomb and firm hand signals. A very large car load of day trippers ahead of us decided to execute a U turn by turning left into a side road then swinging right out across the main road. I began to guess that might be happening just before the car moved slowly into our path, we were going a good clip and the driver wasn’t really wide awake, probably arguing with the family. I had to slow down a bit but it was Isobel’s first experience of my usual reaction which is to shout at the top of my quite loud voice (usually something like “you stupid driver”) as that seems to be the only way to get noticed. The driver looked rewardingly disconcerted and maybe she’ll be a bit more alert in future. I don’t think many people really take seriously their responsibility for driving a lethal weapon around the public highways and I’m aware myself that as a driver it’s easy to feel insulated from the people outside so I feel cyclists have to be assertive. Having powerful brakes like the Pino is quite a help too, especially as the weight distribution ensures very good grip on the front wheel (not tested on that occasion). We wheeled our bike into the tea gardens, stopping for a chat with a mother and children who were fascinated by the bike and we had a succession of questions and comments from people who were intrigued, you are never alone with a Pino. Later on a couple turned up on a conventional tandem, again showing a great deal of interest spiced by their own experience. 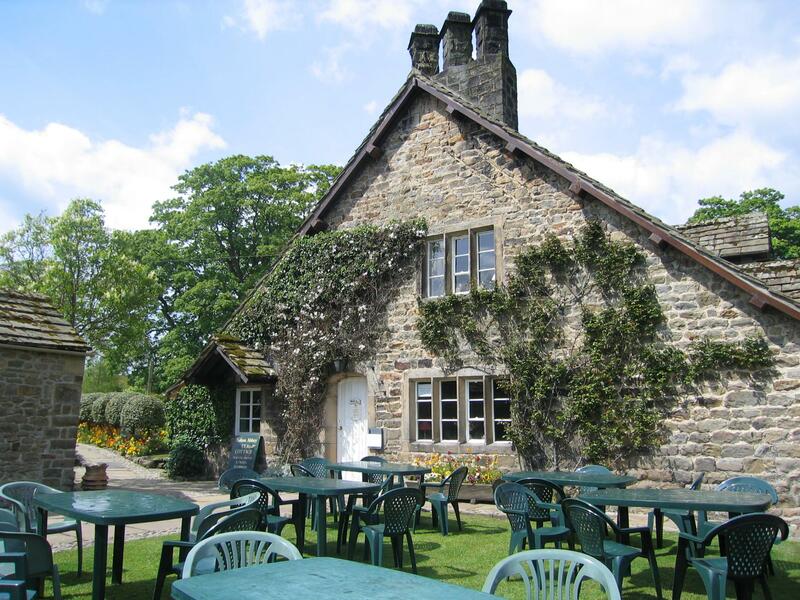 From our point of view, this easy way of connecting with people you run into while travelling seems to be one of the great advantages, we always find the people and lives of places we visit at least as interesting as the scenery, although in Wharfedale the scenery is hard to beat. 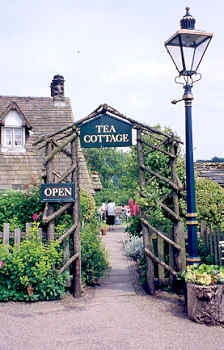 Tea shops are, of course, the main point of cycling, and the Bolton Abbey teashop, with its garden overlooking the beautiful Abbey grounds and river below, is a classic, offering home made cakes and cream teas (proper teapots and a jug of hot water) as well as cooked breakfasts and lunches. We spent a very happy hour before making our way back. On the ride back I began to get the feel of the gears and had fewer clunks and clashes, although they always felt a little out of control. We picked up speed and Isobel felt a little insecure approaching some bends. Later on we realised that often I was able to see the road ahead over the walls and hedges from my higher position so I was confidently going into what looked to her like a blind bend, obviously that’s another aspect of communication we’ll need to work on. We kept up a good effort up the one longer hill although I realised that I was taking a lot of the work so I was tiring more quickly than I’m used to. We started to overhaul other cyclists and, on the last stretch into Ilkley where we had more open roads and maybe a bit of a following wind hit a real tempo which I enjoyed because it gave me the feeling I was really exerting myself. Finally we overhauled a group of diehards (I even had to call out, “on your right folks, coming through” which was a bit gung ho for me) just for the pleasure of seeing them do a double take as we steamed past. I expect they had done 80 miles and had earned their ambling pace. All that effort left my legs a little shaky for the last two starts, including a slight hill start at the traffic lights, but I felt Isobel pulling us away each time so I guess she was finding the knack of it. We cruised into the yard at JD cycles feeling we could easily have gone twice as far and once Isobel starts to find her muscles again we could be looking at some longer rides. We arrived back with no doubts that we were going to buy the Pino, just a few details to sort out and possibly a few weeks to wait for delivery. This entry was posted on 24 May 2009 at 09:57 and is filed under Hase Pino, Tandem Dreams. You can follow any responses to this entry through the RSS 2.0 feed. You can skip to the end and leave a response. Pinging is currently not allowed. It was the new aluminium version which has very good reviews and feels very solid with the big diameter tubes. I expect we didn’t push it as hard as you so I wouldn’t want to comment about relative stiffness. Ruth and John at JD cycles have toured extensively on a steel Pino, they are big people and John’s a very strong cyclist so I would expect them to test the bike well. With a choice of many kinds of tandem from their demonstrator fleet (they sell Orbit, Cannondale and Santana) the old steel Hase was their tandem of choice until they sold it to replace with the new Al demonstrator. I assume your test bike was in good condition? The Pino appeared to be in good condition. The bloke at the shop who showed us the bike and how to cycle on it was very tall and strong cyclist. He commented that when he pushes hard as stoker he can see the boom bend. They’re pitching the steel Pino as a family bike, child as stoker and kiddy trailer/trailer bike at the rear. We’re both reasonably strong cyclists and together weigh around 170kg which might make a difference. But I think we have to head off to another shop that has an aluminium demonstrator. 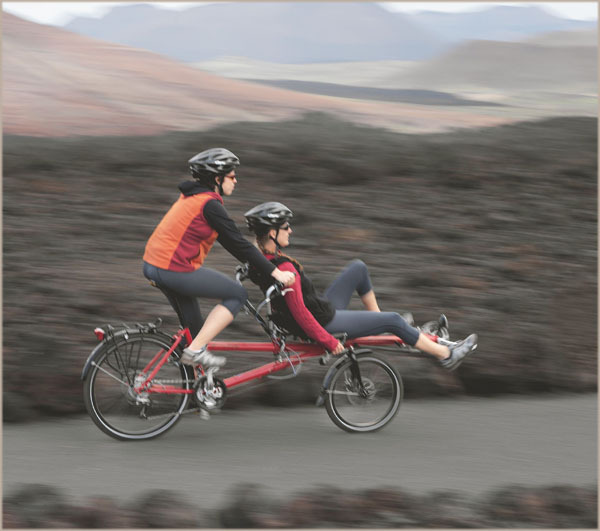 Perhaps also a good idea to try out a traditional tandem as some of the issues maybe tandem related rather than something to do with the Pino. You’ll love the Pino. My partner and I just got one of the new aluminum ones — the Fast version with lightweight components. It’s even better than the steel one we rented for a week last year to see if we’d like it. We’re trying to master the handling on the streets of New York City, which is a bit of a challenge, but so far we’re doing well. I do slightly regret that we didn’t go for the Rohloff, because I have one on another bike and love it, but the regular transmission is fine so far. Good luck! I can really relate to the comments about the cadence and front seat. My wife and I own a 2009 Hase Pino. We love the bike now, but originally had problems with matching our cadence. I ride in the rear and when I got to what was a comfortable cadence for me, my wife did not feel any resistance on the pedals. Basically she could not keep up. When I changed into a gear that worked for her, I was working much to hard. I ordered a 155 mm front crank set from Hase and that solved the problem. We now really enjoy the bike on long rides and it is much more efficient. I do not really understand why Hase puts a 175 mm crank in front and 170 mm in the rear. We also solved the problem with the straps cutting into my wife’s back. We purchased a piece of open cell foam for the seat back, like the foam that came with our bike for the seat bottom. I put the foam on the back between the straps and inside back of the seat. It just covers the area where there are straps. Since the foam has very open cells, my wife has not really had any problems with the seat not breathing and being too hot. We now even ride the Pino in the mountains and it works great! Hi, I wondered how you fitted the bags under the seat on your Hase (in the picture of it loaded up). I know Hase make low-riders to fit below and behind the seat, but you have a second set of panniers infront of these. Is it possible to show more photos of the bike without the bags but with the fittings? Hi Bob, The photos on that page are not of our bike, as we didn’t have it at that point. The loaded bike has two small panniers each side on a Hase Lowrider which is possible if you have the big flip down front stand sold for use with wriggly children. The stand extends the lowrider enough for the two bags. If you look at my photos here you’ll see that we have the low riders for two normal panniers (large Ortleibs) and a bracket for a bar bag that is supported by a collection of bar ends joined together to get the bag in the right position. 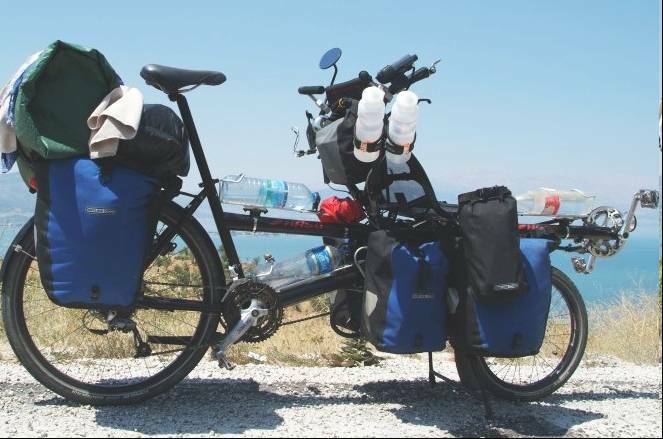 With the Ortleibs and bigger rear panniers (56L Altura Arran) we have plenty of capacity for touring or a big supermarket shop. The bar bag gives my copilot a handy place for on the road stuff and a shoulder bag off the bike.